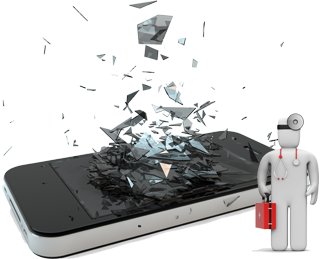 Shattered or cracked screens account for about 70% of all iPhone & Android device repairs. The reasons for this vary from “I ran over my iPhone” to “my three-year-old broke it”. While these activities are not recommended, they have all caused smashed screens and can be repaired. Drop It Off Drop off a repair, & pick up later! One Hour Repair We can repair iPhones in about an hour! Make An Appointment Drop off a repair, & pick up later! Book an appointment at one of our locations near you! MiPhoneDoctor is the source for the highest satisfaction iphone, ipad, ipod and android repairs in the Austin, Round Rock, Lakeway Area. Our technicians are trained and certified to work on everything from cracked screens to physical damage to your device. Our repairs come with a 60 day limited warranty so you can feel secure that once your cracked screen is fixed that it has been properly restored in your device. We use only grade “A” parts to repair your phone. Many times cracked screens on your iPhone can be repaired while you wait and almost all repairs can be accomplished in the same business day. If you have a cracked screen and want your iphone, ipad or ipod restored to it’s former glory then give us a call at 512-354-1615 or schedule a convenient appointment online. We have experienced i-device repair technicians. Why risk damaging your phone elsewhere when we can repair your phone with a 60 day warranty. Don’t settle for second best. Choose iPhoneDoctor of Austin. If your apple device is in need of repair or if you just want to sell your old device call us or Schedule an appointment today.